Songkram 4 X Rajadamnoen Muay Thai Champion and WBA and PABA champion. 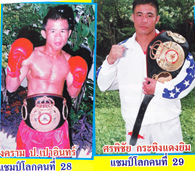 Sornpichai is a former PABA, WBA, and Rajadamnoen Boxing Chapion in Thailand. Congratulations to both trainers that are favorites of guests at TMT.